Update 21 April 2018: ARTC would like to advise the crossing has now re-opened. 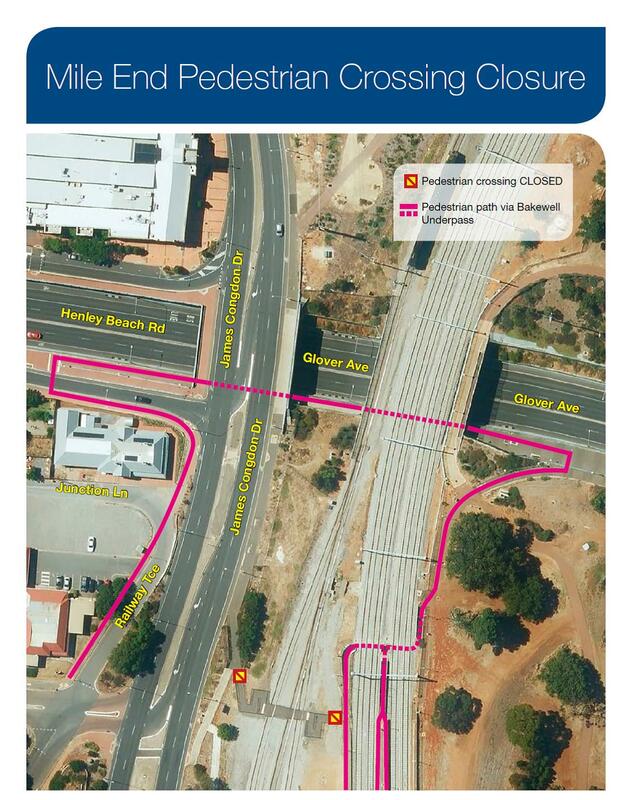 We would like to thank the community for its patience while it was closed during Torrens Junction Rail Project works. We also acknowledge the hard work and commitment of the Mile End community in seeing the crossing successfully re-opened and would like to encourage the community to remain safe when using the crossing, noting it is an operational rail line. We are very conscious of the interest in the Mile End pedestrian crossing re-opening and expectations that this would occur before the end of 2017, based on the advice we had available to us in May 2017. Unfortunately, due to project delays and critical signalling work that remains to be completed as part of the Torrens Junction Rail Project (being delivered by the Department of Planning Transport & Infrastructure) – this signalling work which impacts freight train operations is still to be delivered by the project. We are working with DPTI to try resolve this matter and we expect we will be able to provide a further update early in the New Year. Please accept our apologies for this delay and we do appreciate the pedestrian crossing closure remains an ongoing inconvenience for the wider Mile End community. We appreciate that the community is also frustrated as there are no physical works in place at Mile End itself and the perception there is no impacts to train operations. This webpage and information below describes the issues faced at the crossing and we hope helps clarify how the Mile End crossing and Torrens Junction Project works are related. The Mile End Pedestrian crossing is currently used both by commuters travelling via the Adelaide Metro passenger services and by members of the public walking between Adelaide city and the western suburbs. Freight trains are required to give way to passenger services at the Torrens Junction to the north (due to signal location and length of freight trains being up to 1500m long) and as a result can sometimes block the pedestrian crossing adjacent to Mile End Train Station. Regrettably, there have been multiple incidents of unsafe behaviour (including walking through, under and around freight trains) recorded on CCTV. This poses a real and significant safety risk as trains can move without notice, including backwards, which could result in serious harm or a fatality. In response we were required to undertake a risk assessment which found the best option was to temporarily close the crossing. The Torrens Rail Junction Project which commenced in January 2017 will separate the passenger and freight lines – significantly reducing the need for freight trains to stop over the crossing. The upgrade will also cause changes to train movements which need to be reviewed and the risk level gauged prior to the crossing re-opening. We are confident the rail upgrade will adequately reduce, if not entirely remove the risk so we have installed gates in the fencing erected for the closure which can be opened again quickly and easily. The nearby Bakewell Underpass remains the safest option for people walking to the Mile End station or the parklands and city. The temporary closure will not impact Adelaide Metro passenger rail services.